I’m apparently the poster child for Twitter suddenly flagging accounts as containing sensitive material (thanks to AdWeek and Mashable). A bunch of people have had the same issue, and don’t know what to do, so they’ve been DM-ing me to ask what I did about it. I’ve put what I know here so people can hopefully find it more easily, and it’ll be easier for me to just reply with a link instead of describing the solution again. 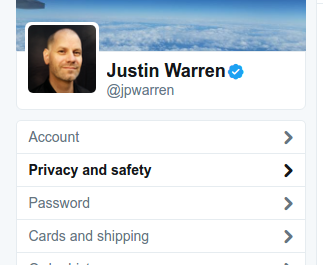 Click on Privacy and Safety over on the left. Then scroll all the way to the bottom and look for the Safety section. Uncheck Mark media I Tweet as containing material that may be sensitive. Disable Mark media I Tweet as containing sensitive material. If you don’t want Twitter hiding stuff from you just because they think it’s sensitive, then check Display media that may contain sensitive content. I haven’t found a way to go back to media I’ve already tweeted that was flagged as sensitive and mark it as not sensitive, so if you find it, let me know. Also, according to AdWeek, Twitter might change this setting back if people report your media/tweets as being sensitive and they look at it/their algorithms look at it/they just randomly change things. If your account gets the “may be sensitive” warning again, check the setting hasn’t been changed. « Why Care About The Spelling Of On-Premise?